Joined by her 5-piece bluegrass band “The Sweet Sound Revival”, Rosemary will make a stop on her “Have a Little Faith” Canadian tour playing songs from her Global Music Award-winning album Plum Coulee, My Home featuring gospel, bluegrass, country music, and inspirational story-telling! 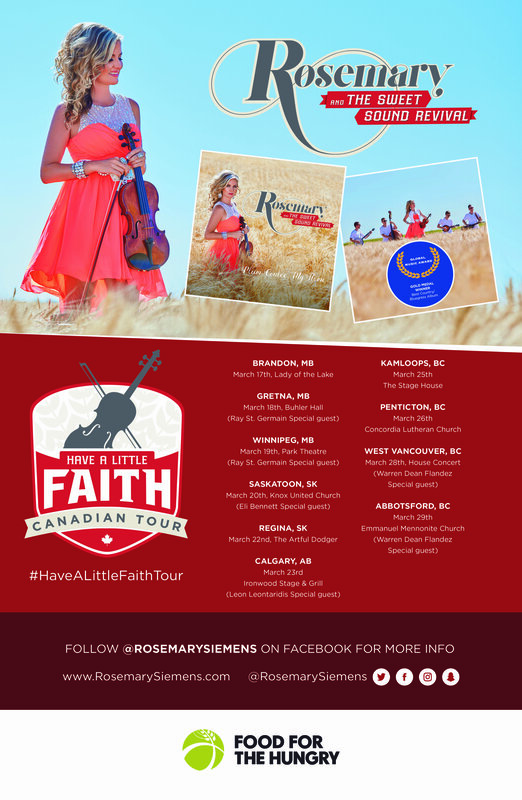 Join award-winning Canadian violin and vocal sensation Rosemary Siemens on her “Have a Little Faith” Canadian tour. Rosemary has performed four times at New York’s Carnegie Hall and was the first violinist to ever perform at the Sistine Chapel and St. Peter’s Basilica at the Vatican in Rome.